The victims of the terrorist attacks of September 11, 2001 are honored each year in our city. The Healing Field tribute of nearly 3000 flags is at a park in downtown Tempe, Arizona. The flag poles are six feet tall and spread over two acres on a grassy field near our lake. It is a heart breaking experience to see America’s red, white and blue flags with gold stars waving in a gentle breeze, and once again feel the grief of that horrific day. The tribute will be from September 10-13. Each flag has a tag with the name of the person killed. A pair of combat boots rests underneath the flag poles of the ones who were members of the military. There are stuffed animals tucked beneath the flags of the children lost. Last year my husband and I, along with others, meandered through the flags and stopped to read some of the names. We wondered, were they a father, a mother, an executive, a pilot, a waitress or a firefighter? We knew each one had left behind family and friends who still mourn their deaths and remember them with a love that will never die. 9-1-1 tragedy, all Americans are free to love and live…a love which overcomes grief and brings hope for the future that I felt in the joy of a little girl’s laughter. People Magazine did a feature article on the babies born after 9-1-1 to the grief-stricken widows of the men who died in the Twin Towers and passenger jets. The photos showed adorable infants, enjoying their gift of life, cuddled in their mother’s arms. The journalists wrote about the preparations they made for the photo op, purchasing diapers, wipes, pacifiers, blankets, bottles and formula…all so everything could be perfect for this moment in time. In spite of the horrific deaths of their fathers, new life was born to carry on the legacy of America’s freedom. My husband, John, and I embraced, and with my head tucked under his chin, we prayed. For us the Healing Field was also a Praying Field. We prayed for all Americans, especially for those whose loss on 9-1-1 no words can describe. We are both in our 70s and we have proven that God’s care is there when we’ve struggled through personal tragedies…His love never let go of us. For our family, it’s true what the scripture says in Psalms 34:18, “The Lord is near to the brokenhearted…” (NIV). All across America people will gather in unity on September 11, 2015 to remember the victims, to heal, love and pray. My husband and I will be there once again at the Healing Field in Tempe to honor the victims and their families and friends. I would love to hear from you and what you do to remember 9-1-1. 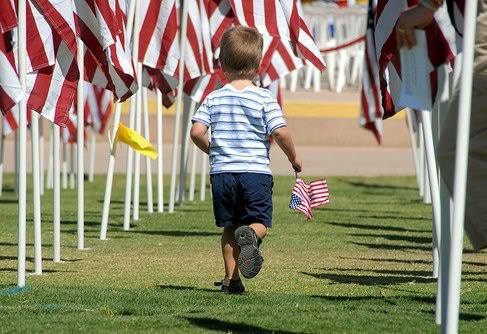 Image | This entry was posted in America, Grief, Healing Field and tagged 9-1-1, AZ, patriotism, Tempe. Bookmark the permalink. Since I’ve worked from home for the past 10 years, I haven’t taken part in any official ceremonies. We do, though, have moments of silence at the time the planes hit to honor the deceased and their families. Thank you for commenting on my Healing Field post. I think your silent tribute, as a family, is a wonderful way to remember the lives lost on 9-1-1. We live close to the healing Field so will go there this Thursday. I’m so glad you can work from home too. Wonderful reminder of one of the most devastating days in our recent history. It still holds the power to bring tears, as I imagine our Redeemer God holding out His hand to guide those of His people who lost their lives to eternal home. Thanks for this lovely post. Thanks for the reminder! I’m planning to go this year. Every year I think back on what I was doing that day when I heard the news (I was driving to work when the bulletin broke in). I remember how numb we all felt, filled with unbelief that we were at war, and our supervisor setting up a TV so we could stay up to date on how everything transpired. I also remember how quiet the skies were other than the occasional military jet – peaceful, yet a little eerie. I have a “special” t-shirt (FDNY) that I wear every year on Sep. 11th. I really enjoy your blogs Betty, even if I get a lump in my throat sometimes reading them. God Bless!